That day, I was lost! Have so many things in the fridge till I dunnoe how to mix and match the foods that I had. Thankfully, ideas kept coming thru' to my brain. Ta da! 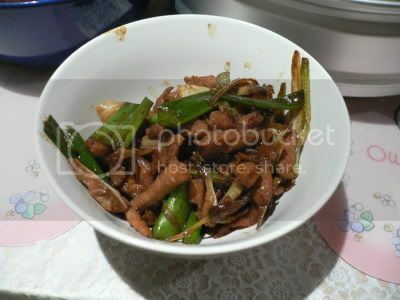 Stir Fry Pork Strips with Scallions. 1. Marinate pork with the above seasonings for 30mins. 2. Heat oil in a wok, throw in chopped garlic, stir fry till fragrant. 3. Add pork strips to wok, fry for 1min. 4. Add spring onions to fry with pork till tender. 5. Dish out to serve.